Truly move-in ready, spacious, end unit in the beautiful park like setting of Rivercliff Estates. The dated popcorn ceiling is GONE (required asbestos abatement) NEW brocade textured ceilings, NEW paint, carpet, light fixtures and more..Newer Milgard double paned vinyl windows and sliders, Newer laminate flooring and tile on main level.Large 1896 SF condo boasts 3 large bedrooms, 3 bathrooms, open concept kitchen, dining and living on the main level. Updated kitchen with newer cabinets, quartz counters, tile backsplash and floors...stainless steel appliances. Large living room features laminate floors, gas fireplace, Milgard slider to a covered deck with views of the lovely treed common areas, the complex pool and Mt St Helens. 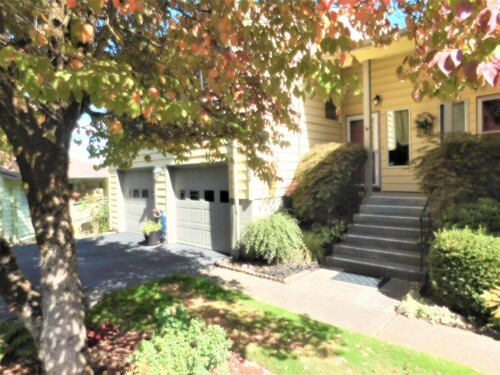 Oversized 2 car garage with level driveway for parking and ample visitor parking is opposite driveway. Rivercliff Estates is on leased land until 2067. Must be owner occupied, and not FHA approved. This is a beautiful, well maintained community with mature trees, gentle rolling hills and a very well run and stable HOA. Enjoy the pool, clubhouse and community garden! Near Glendoveer golf course and the new Von Ebert Brewing. Minutes to Portland airport.